I am a creature of habit. I’m not the kind of person who opts for something new and unusual on a menu – I’m much more likely to go for something I’ve had and enjoyed before. Why choose something you might not like, when you can have an old favourite instead? So for me, Indian food pretty much always means saag paneer. Spinach + cheese = heaven. Why would you go for anything else? This saag paneer took me about 30 minutes to make because, if I’m honest, I can be quite slow in the kitchen and it takes me forever to chop an onion (…should I be admitting this as a food blogger?). I know the ‘proper’ way to do it, but it still takes me ages – and it doesn’t help that I get distracted every few seconds and stop to do something else, like jotting down the recipe or cuddling the dog. If you’re some kind of onion chopping ninja and you have an attention span of more than 30 seconds, you could probably get your saag paneer on the table in more like 20 or 25 minutes. Perhaps we should have a saag paneer-off. 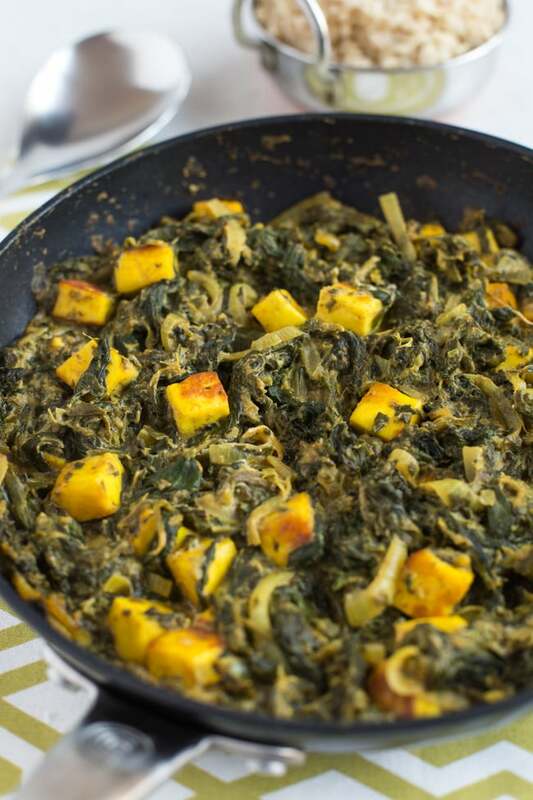 However long it takes you, this saag paneer is really easy to make. I used frozen spinach because it’s really convenient, and it also gives the texture I wanted. You could use fresh spinach instead if you prefer, but it may end up looking slightly different. If you have a big bag of fresh spinach in the fridge though, it is a great way to use up the whole lot in one fell swoop. Saag paneer is a really simple curry, with only a few major ingredients. The creamy paneer is an amazing contrast to the spicy spinach (drooling a little as I type this…). It can either be served as a side dish or as a meal in its own right, with rice or naan bread for dipping. Either way, it’s delicious. Heat the oil in a large frying pan, and add the sliced onion and diced paneer. Cook over a medium heat for 5-10 minutes, until the onion is soft and the paneer is starting to turn golden brown. While the paneer is cooking, start to defrost the spinach in a bowl in the microwave. Don't worry if it's still a little bit icy - I cooked mine for about 3 minutes. When the onion and paneer are ready, add the garlic, ginger, spices, and a good pinch of salt and pepper. Cook for one more minute to toast the spices. Next add the tomato puree and maple syrup, then the defrosted spinach (including any liquid). Mix well and cook for 5 more minutes, until everything is piping hot. You can add a dash of water if the mixture seems too dry (though the creme fraiche will loosen it up a bit too). Remove from the heat, and stir through the creme fraiche. Serve warm. 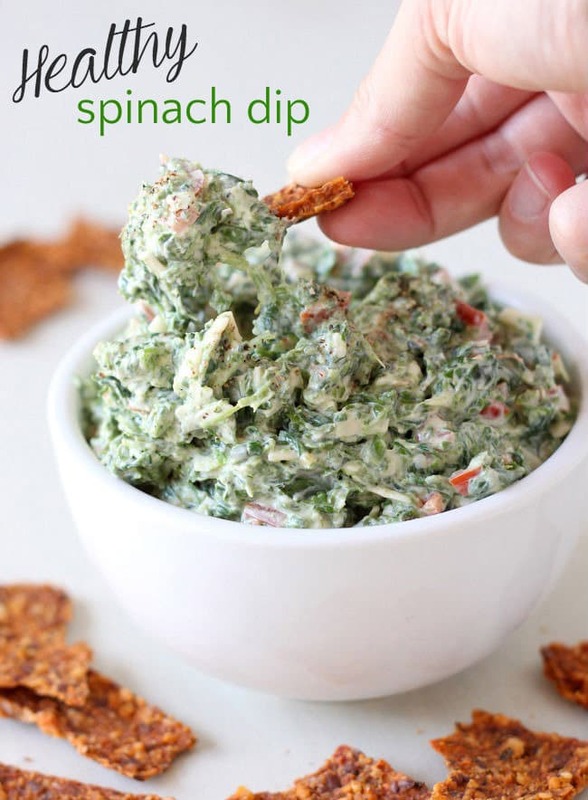 Frozen spinach is also perfect for making my healthy spinach dip – it gives a brilliant texture! Can I substitute ginger powder for puree? If so … what is the conversion rate? Thank you! Sure! 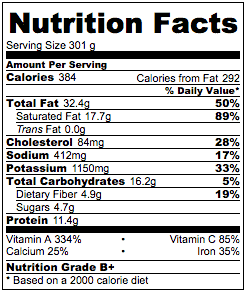 I’m not too familiar with ginger powder but maybe start with 1/4 tsp and you can always add more if needed? I love Indian food, especially anything that includes saag! This looks utterly delicious, as always. I love saag :D and Indian food in general! Their veggie options are really good and can be quite healthy minus all the oil. That’s why homemade is so much better :) I’ve never tired paneer. Sounds like I’m missing out! I only actually tried paneer for the first time this year and I fell in love. I have been seriously missing out. Thanks for this post. 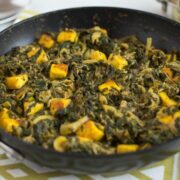 I really want to try making saag paneer. This looks amazing. I am still yet to try paneer! I love saag aloo though so I imagine this can only be better! So glad I’m not the only one that gets sooooo easily distracted! Haha definitely not, it’s so hard when you’re your own boss – nobody around to tell you to focus! 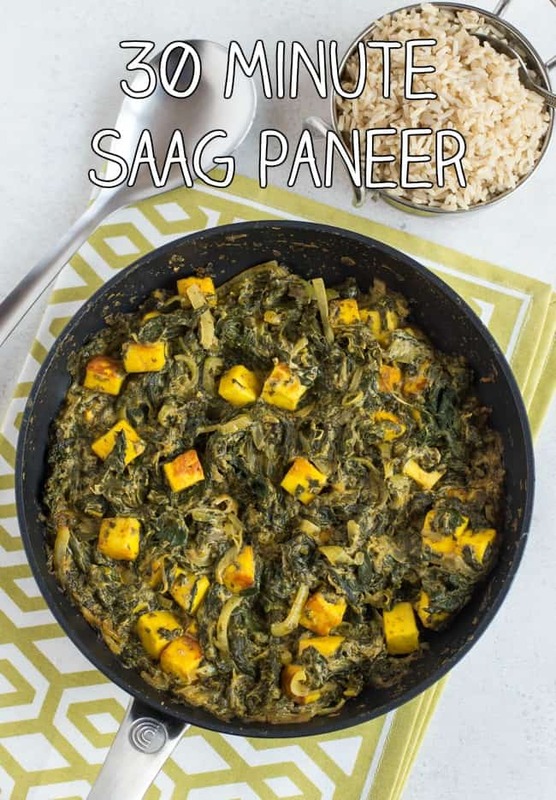 I haven’t tried sag paneer yet, although I have used spinach in other curries. I’ve only recently started to like it – I used to find the taste too overpowering, but the baby spinach they sell in packs is just about right. I must try this, and see what I think…. 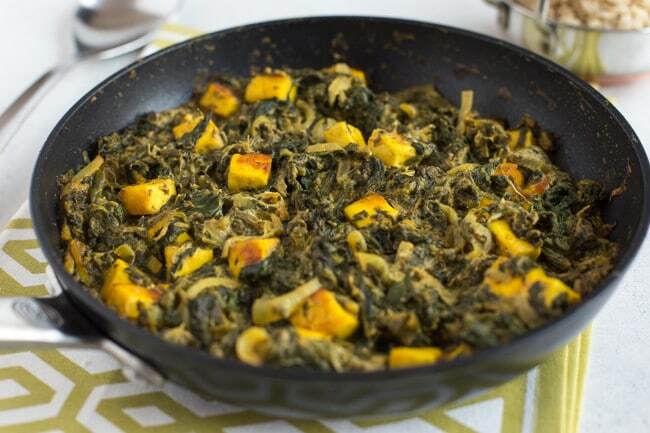 Oooh, this saag paneer looks absolutely delicious! OMG!! I love saag paneer. I have some paneer from the Indian market in my freezer. Yum! Thank you!! I’ve never even thought of freezing it – good tip :) It usually doesn’t last that long in my house! I love saag paneer! But I can think of ONE reason not to order it every time: veggie korma! If you’ve never had it, trust me! So good! Haha! I actually find a korma a bit too rich sometimes! Oh wow! I’m cooking my first rogan josh and the weekend and this saag paneer is going to go perfectly with it. Thank you so much! 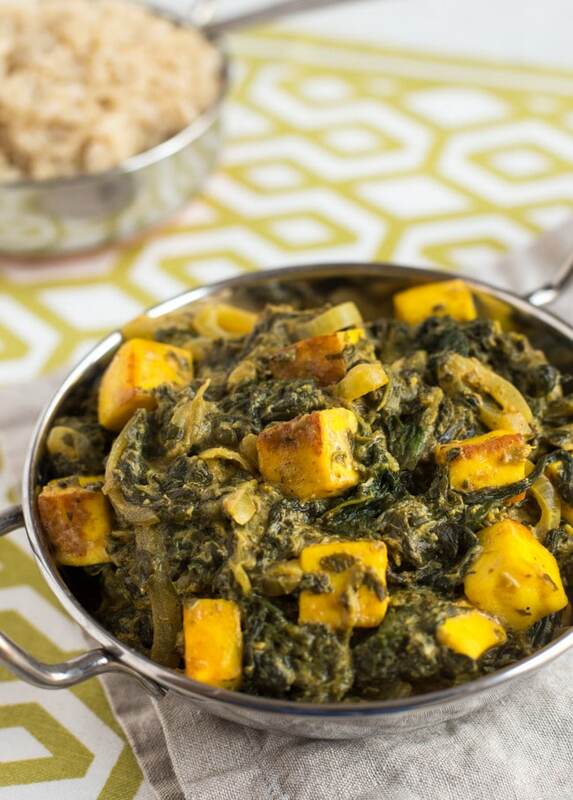 We always get saag paneer as a side – one of my favourites – paneer is so good in a curry. I often get a saag paneer side and a tarka dal side, and don’t bother with a main course :) It’s always a winner!